Sunita Dhairyam - My speciality is oil on canvas. I paint wildlife of India. Bandipur Tiger Reserve, one of the last real refuges for the wildlife in India and what I call home for the past 17 years is my source of inspiration. Though beset with problems, the natural diversity around me fascinates me and provides me the subjects that I paint and fight for in my role as a wildlife artist and conservationist. I firmly believe that with tolerance and compassion humans and animals can live side by side in harmony. The following quotes by Mahatma Gandhi have been a constant reminder and source of inspiration to me in all my actions and projects in conserving the bio-diversity in the Indian Sub-continent and the “ Ecological Hotspot’’ that is the Western Ghats of which the Bandipur Tiger Reserve is a part of. of Sunita Dhairyam and is protected by international copyright laws. Use of nature art, wildlife art or any other images or text from this site, requires permission in writing from Sunita Dhairyam (). This site is part of the Artists for Conservation (AFC) Web site. 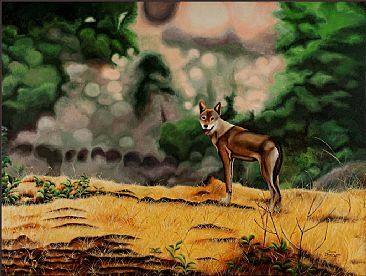 (Wildlife Art - Nature Art - Conservation) Artists for Conservation is an international, non-profit organization dedicated to nature art, wildlife art and conservation. On this site you will find world-class nature art and wildlife art by today's leading nature artists & wildlife artists. The AFC site is the Web's premier location for nature art, wildlife artists All content appearing in pages featuring Sunita Dhairyam is the sole responsibility of Sunita Dhairyam. The opinions expressed on these artists' pages are those of Sunita Dhairyam and do not necessarily reflect those of the Artists for Conservation Foundationi (AFC).